The holidays are quickly approaching again, and what better way of showing your appreciation than by giving well-considered gifts, rewards and incentives? There are so many people that contribute to the successful running of a business – employees, vendors, management, sales and customers. Each participates in some major way, and deserves to be recognized through incentive programs, loyalty programs or rewards programs. Let Strategic Incentives help you say “thanks” in just the right way. Workforce Programs: Your employees are the grease that keeps the engine of your business humming smoothly. The holidays are an especially appropriate time to show thanks through involvement, customer satisfaction, or productivity and quality programs. Premiere Recognition: Showing that you really appreciate a job well done will help in raising employee engagement and increasing organizational performance. These recognition awards are perfect for on-boarding, training completion, sales achievement, attendance, safety, anniversary, or suggestion participation. Channel Partners: Keep the flow of business coming with a sales incentive program that targets your sales staff or sales channel. Let us help you design a team building program that will motivate partners to achieve established objectives, reward them when they are successful, and enhance channel sales efforts. Customer Loyalty Programs: With the constant onslaught of marketing and digital shopping opportunities, a customer who comes back to your business again and again is a valuable commodity. Show your appreciation with a customer loyalty program from Strategic Incentives. Take a look at our merchandise, travel, or debit card awards and think about how they will make your customers feel about you. New Customers: Once your current customers are satisfied, you can begin working on attracting new blood to your business. Our promotional marketing opportunities can help your company stand out from its competition. Choose from promotional products, corporate apparel, and corporate gifts, or let one of our professional sales reps help you find something that’s just right for your company. There are many reasons to say thanks during the holidays. Honor your employees this Holiday season by recognizing not only their accomplishments, but also their performance and loyalty. Call us at 1-888-686-8116 or email us at info@strategicincentives.com today and we’ll help you develop the perfect plan that fits your corporate culture. 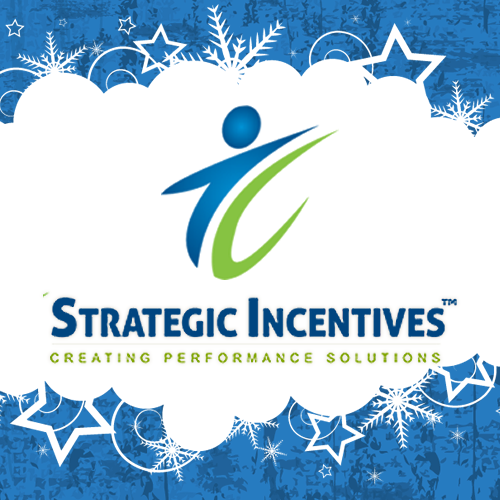 Happy Holidays from Strategic Incentives! About Strategic Incentives: Strategic Incentives is a leading nationwide provider of employee motivation programs. The company works with HR managers to implement sales incentive programs and safety incentives to retain employees, and loyalty programs to build customer relationships. Visit the website at http://www.strategicincentives.com to download a complimentary PDF of “35 Ways to Use Incentive Programs.” “Like” the Facebook page to receive regular updates on sales incentives and promotional ideas. Call 888-686-8116 for more information on creating an in-depth performance improvement plan.